It seems Lex Luthor has unveiled a plan to usurp Superman as the preeminent power in Metropolis, and once again he appears to have accounted for every possible out the Man of Steel could discover. This round, Lex has been infused with the power of a god, gifted by a nameless, faceless entity formerly housed in the Phantom Zone. 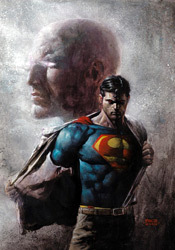 Naturally, though, Omnipotent Luthor's first act isn't something out of the Old Testament – no "let there be light" or creation of intelligent life – it's to loose Doomsday on the major players of Reign of the Supermen, then summon Clark to an uninhabited galaxy for a little gum flashing and lip wagging. For all the grandiose astronomical possibilities offered to Luthor in his new role, he seems genuinely content with merely flaunting it in Superman's face, waving empty threats even after they've been blatantly disarmed. It's in keeping with Lex's long-standing character flaws: he might just be the smartest man on Earth, but that intellect is counterbalanced by crippling bouts of emotional knee-jerks. Boiling it all down to that one point, though, leaves the larger narrative feeling empty and pointless, like we've spent another twenty minutes of our lives learning something we already knew. For someone who's proven his genius time and time again, Luthor remains incapable of learning from his past mistakes, which makes him little more than a predictable plot device all gussied up as something more substantial than he really is. No matter what wrinkles Paul Cornell may throw into the process this month, as long as that basic formula remains the same, the end result will remain unsatisfying. Fortunately, Cornell's redundant primary story is backed up by a fistful of imaginative musings on the Kal-El mythos without the bulky anchor of ongoing continuity to hold them back. Boasting an impressive roster of loosely associated talents, these bite sized peeks into the more fantastic elements of Superman's existence are a real treasure trove, almost worth the price of admission by their lonesome. Where the long form A-Side story seems like a necessity, these mini sagas (in the same vein as Batman Black and White) are more a celebration of the character's potential. Damon Lindelof pastes a human face on an impending Kryptonian disaster. Paul Dini gets to know one of the permanent residents of Kal's fortress of solitude. Geoff Johns gives the Legion of Super Heroes a rare opportunity to let their hair down. What this cavalcade of backup stories might not share in genre or subject, they more than make up for with a shared sense of wonder and initiative. They're the backbone of this issue. So, in short, if you're looking for the latest and greatest challenge to face the Man of Steel, an event the magnitude of which will send reverberations across the DC landscape, this isn't it. As a continuing narrative, it's distressingly shallow and hopelessly redundant. Its supporting act, though, effectively steals the spotlight and offers a glimpse into everything this character and his surroundings could potentially be. After closing the cover on this one, I wasn't anticipating my chance to pick up Action Comics #901. Not a bit, actually. I would, however, be among the first to pledge my support for a more loosely themed anthology of small takes like the ones I saw in the latter half of this package. Flip through it and hover over those closing shots for as long as you can. The rest is nothing to get excited about.